Lamont Dozier, one third of the legendary writing and producing trio Holland-Dozier-Holland, is set to release an album this year re-working his classic Motown hits. Legendary songwriter, producer and performer Lamont Dozier has announced that he’ll be releasing a new album of “re-imagined” versions of his classic Motown hits. Recorded with producer Fred Mollin at Royal Studios in Memphis, the album will feature new arrangements of classic Motown hits originally performed by The Supremes, The Four Tops, Marvin Gaye and many more. The album title is yet to be announced, but according to SoulTracks Dozier will be joined by duet partners Gregory Porter, Sir Cliff Richard, Graham Nash, Rumer and Todd Rundgren. 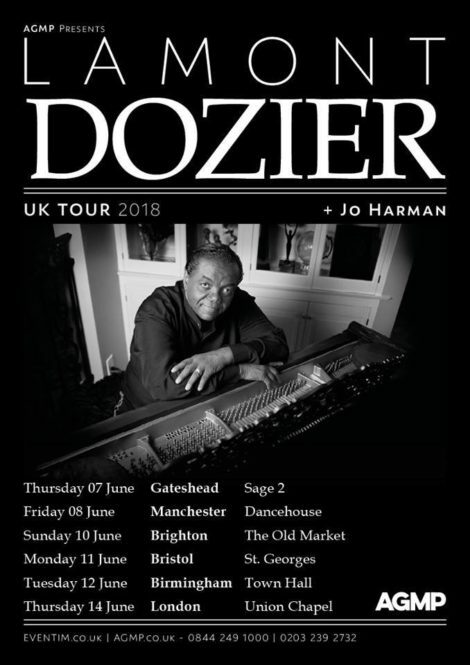 On the first single to be released from the album, Dozier has covered the Four Tops classic ‘Reach Out (I’ll Be There)‘ with British jazz vocalist Jo Harman. Unlike the original, this new version is much slower than the Four Tops version, and is a rather inspired re-working of a classic that is known and loved throughout the world. At 76 Dozier’s voice remains as strong and impressive as ever, and Harman elegantly compliments his seductive vocal with her jazzy tones. The stripped track features some excellent piano work, which then gives way to a gospel choir at the songs climax. If this first single is anything to go by, Dozier’s new album is set to be a real treat. UK fans are in for an even bigger treat, as Dozier is set to embark on his first ever solo tour of the country. He’s set to be accompnaied by both Fred Mollin and Jo Harman, and is expected to perform songs off his new album as well as telling some of the stories behind the hits. Impressively, the first announced date of the tour, a performance at London’s Union Chapel, has already sold out (promoters have, thankfully, added a second date). Interestingly, Dozier has already released a similar album: in 2004 he released an album titled Reflections of Lamont Dozier which featured stripped back, slower versions of Motown songs H-D-H wrote and produced. The album was fairly well received, so it’ll be interesting to see how Dozier’s latest re-working of his Motown back catalogue will compare. For those who are unaware of Lamont Dozier’s history, he was one of the architect’s of the “Motown Sound” in the sixties. He formed one of the most successful writing partnerships ever with brothers Brian and Eddie Holland to craft hit after hit for Motown, responsible for some of the most memorable and well loved hits released by the label. They became known as ‘H-D-H’, and they were responsible for crafting big hits for the Four Tops (‘Reach Out (I’ll Be There)’), ‘Standing in the Shadows of Love’, ‘Baby I Need Your Lovin” and more), Marvin Gaye (‘How Sweet It Is (To Be Loved By You)’), and virtually every hit song The Supremes ever released. By 1968 however, H-D-H were growing frustrated with Motown, with the Holland brothers leading the charge that Motown’s founder Berry Gordy was keeping royalties from them. The dispute grew into a standoff, with each side suing the other, resulting in an expensive legal battle that would last years. H-D-H left Motown, and Motown lost it’s best writing force: neither would be the same again. H-D-H struck out on their own, forming their own Invitcus and Hot Wax record labels. Their biggest hits were with Freda Payne, who scored a UK Number One single with ‘Band of Gold’, and the Chairman of the Board, who also scored a UK hit with ‘Give Me Just A Little More Time’. As the H-D-H partnership began to end, Dozier started to record himself, recording classics such as ‘Why Can’t We Be Lovers‘ (featuring Brian Holland), ‘Fish Ain’t Bitin” and the original version of the disco classic ‘Going Back To My Roots’. By the eighties swung arounf, Dozier was working as a producer and writer for some of the decades biggest stars, including Simply Red and Phil Collins. He worked with Collins to provide the soundtrack to the British film Buster, which included two standout songs: Collins’ ‘Two Hearts’ (which won him a Golden Globe for Best Original Song) and ‘Loco in Acapulco’ which was given to his former Motown colleagues the Four Tops. In 1990 Dozier, along with the Holland brothers, was inducted into the Rock and Roll Hall of Fame. Since then, he’s been fairly quite – making a few appearances on other people’s records, including Sir Cliff Richard’s Soulicious album, but it finally looks as if we’re going to get something new from Lamont Dozier pretty soon.